ADRA (Syria) (Sputnik) - The first organized passage of 52 civilians took place out of Syria’s Eastern Ghouta through the humanitarian corridor in the early hours of Sunday with support of the Russian center for Reconciliation in Syria, the center’s spokesman Maj. Gen. Vladimir Zolotukhin said on Sunday. "Today, 52 civilians were withdrawn from Eastern Ghouta, 26 of them were children. Now they are in the settlement of Adra on the territory of a former driving school. The humanitarian situation is being clarified. Within two days, they will be provided with all the necessary assistance, including medical," Zolotukhin told reporters. The civilians, who left the crisis-torn territory of Eastern Ghouta, have expressed gratitude to the officers of the Russian center. The UN Security Council unanimously adopted resolution 2401 that urges all parties to the conflict to immediately stop all clashes and adhere to a long-term humanitarian pause on the entire territory of Syria in order to ensure the safe and unhindered humanitarian aid supplies as well as medical evacuation of those injured. Eastern Ghouta was occupied by militants in 2012. According to Syrian Army estimates, there are 10,000-12,000 militants in the region. 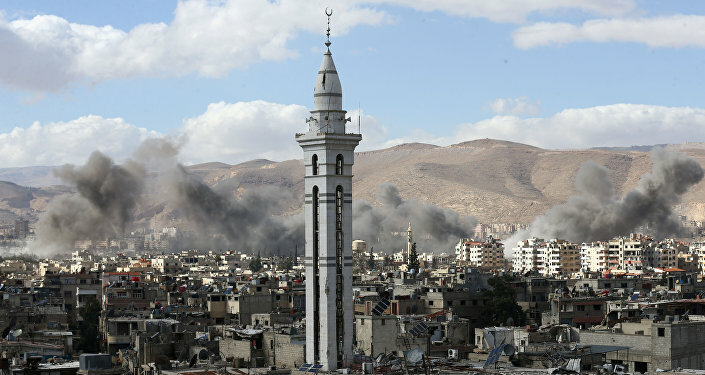 Despite the recent UN resolution, the combat has not ended, even when the humanitarian pause was in place, the Russian Defense Ministry's center for Syrian reconciliation said. As militants regularly target all exits from the area, civilians have been unable to leave the area.